Proposals for a tram route between Nottingham and a Derbyshire town are to be investigated. Amber Valley and Broxtowe councils are hoping to fund a study into a line from the city to Ripley, via Eastwood, Kimberley and Langley Mill. The line, which could cost £180m, would relieve congestion and create new jobs, councillors have said. Nottingham's current tram extension has been criticised for overrunning and disrupting residents and businesses. 'Ticks boxes' The £570m extension was due to be open by Christmas but will not now open until next year. Richard Robinson, from Broxtowe Borough Council in Nottinghamshire, said the Ripley planners would "learn from" the problems encountered with the Chilwell and Clifton extensions. "We have got two options, we can do something or we can do nothing. If we do nothing, the congestion is going to continue," he said. "Because we are planning for this now, when this comes to Ripley we can plan for that and make this successful." Return of the Ripley Rattler? 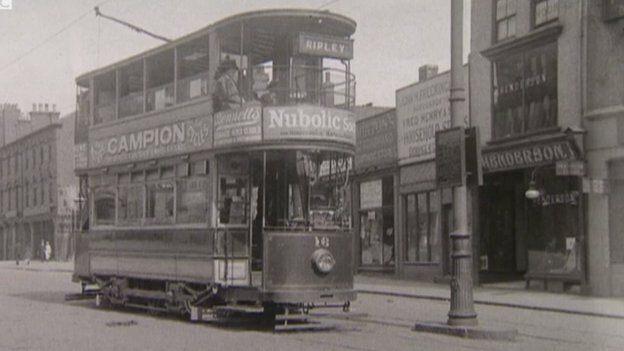 It has been 101 years since trams ran between Nottingham and Ripley. Known as the Ripley Rattlers, the trams ran via Kimberley and Eastwood from 1913 to 1932. The first phase of Nottingham's tram system cost about £15m per kilometre, so the 7.5 mile (12km) route from Nottingham to Ripley could cost £180m. Paul Jones, leader of Amber Valley council in Derbyshire, said some of the money could come from the European Union. "It's two different councils across county council borders. There's deprivation in Eastwood and Langley Mill," he said. "It ticks lots of boxes with the European Union and I am confident they will be able to support it." 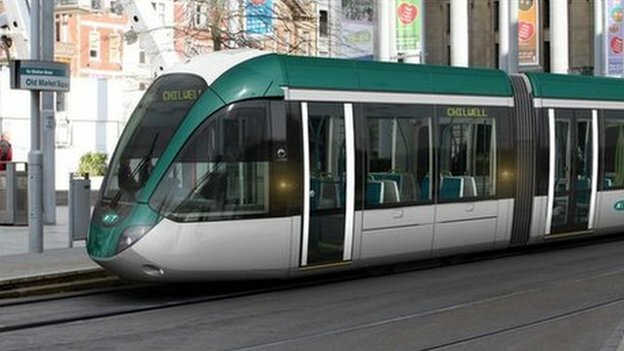 Nottingham council has also said the tram could be extended to East Midlands Airport or the proposed HS2 station in Toton. Lines to Bingham and Erewash in Derbyshire are also under consideration.